One of the interesting aspects of writing for the ear is that the result is a physical thing. These are words not to be read on a page but to be spoken by someone who must take in a breath and then deliver each statement with appropriate volume, emphasis and pacing. I was reminded of this while listening to WCPN's Around Noon program Thursday (April 15) and Dee Perry's interview with Estelle Parsons, currently starring in August: Osage County at Playhouse Square. The Oscar-winning actress described the effort she expends during the production. "Your voice comes out of your body," she said. "Your acting comes out of your body. When I wake up in the morning I feel like a truck ran over me and very often when the play finishes my ribs hurt ... and I'm a very in-shape person." Of course a stage actor must project her voice without any electronic boost. But even someone using a microphone at a podium has to "put something into it," or else his voice will come out flat. Words that are written for the ear are easier to express to an audience with the proper emphasis and pacing. 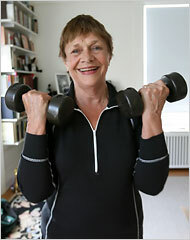 But it also helps to be physically fit, like Estelle Parsons, and to be nervous, like most of us. As I've said before, we can turn our nervousness into energy. We'll be pretty tired afterward, but it will be a satisfying fatigue.